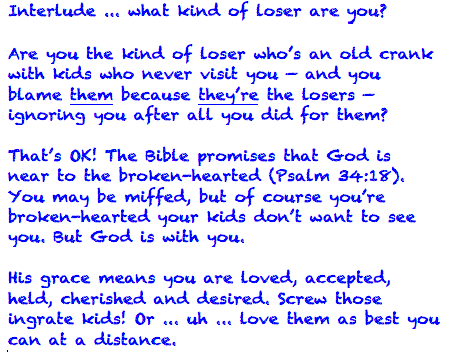 Loser’s Guide to God’s Grace ebook now available at Amazon! If you don’t want to wait for the entire story to unfold here, please get the ebook from Amazon today! It will be available from ibooks and others soon. It is only 99¢ — I wanted to make it free, but some ebook vendors won’t offer it unless you charge at least 99¢. If that is a problem, let me know, and I can send you a PDF. For now, search Amazon for Loser’s Guide to God’s Grace by Jane W, and you will find it! Thank you! Please spread the word. And enjoy the book! God loves you! Interlude: What kind of loser are you?